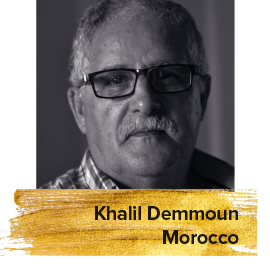 Regarded as one of Morocco’s most important film critics, Khalil Demmon is a writer, professor and film critic who studied Literary Criticism in 1973. He is the President of the Moroccan Association of Film Critics and Chairman of the Forum of Thought, Culture and Creativity in Tangier. He has been a member of the organizing committee for many Moroccan film festivals including the Marrakech International Film Festival in 2001 and the Tangier International Film Festival in 2005. In 2015, he was named President of the African Federation of Film Critics (FACC).